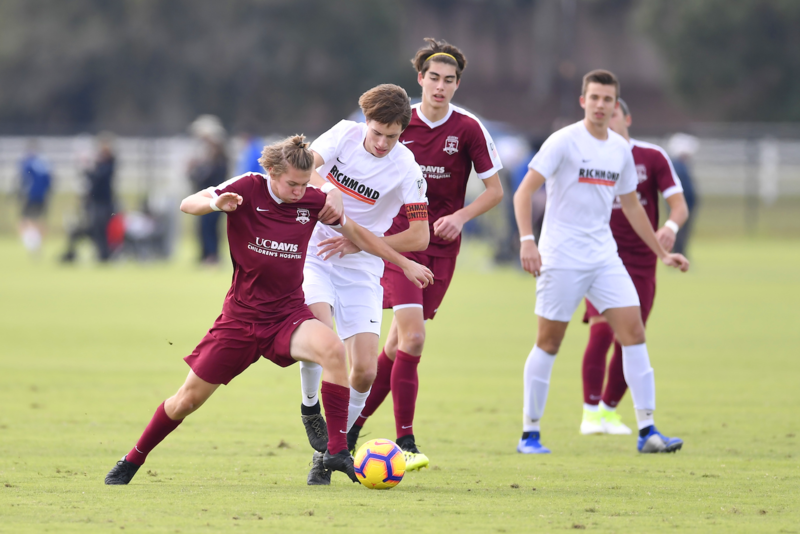 After a back-and-forth first half, a barrage of second-half goals boosted Sacramento Republic FC past Richmond United in the first feature game of the 2018 Development Academy Winter Showcase. Sacramento broke open the cross-country clash midway through the second half when defender Scott Nicholson netted the game-winner, and quick transition goals from midfielders Nicholas Hategan and Julian Madrigal down the stretch iced the game for the California-based club. In the first half, Sacramento got on the board first with a penalty kick conversion from Hategan after defender Travian Sousa was tripped up in the box. Richmond responded with a quick strike in the 23rd minute, as midfielder Jacob Thomas collected a well-placed long ball on the run down the left wing and cut it back to midfielder Ryland Maragh, who finished cleanly to equalize. Sacramento finally wrested control of the match in the 76th minute. Managing to keep the ball alive in the box despite Richmond's best efforts to clear, Sacramento scrambled the ball out towards forward Quincy Butler near the corner. He played it across the box to the late-rushing Nicholson, who hammered it home to give Sacramento a lead it would not relinquish. Just two minutes later, Butler collected a long ball from midfielder Euan Clark on the run down the right wing, and he played it in past two defenders to meet the onrushing Hategan perfectly. The midfielder one-touched it past the 'keeper to bag his brace. In the 87th, Sacramento iced it with another quick goal, working the ball across the field in transition to Madrigal, who slotted it between the 'keeper's legs for the game's final goal. The second feature game of the 2018 Development Academy Winter Showcase's opening day saw Real Colorado take down Pateadores of California 3-1 in a thriller. A tense, even encounter for 90 minutes, Colorado's Ayman Bushara netted the game-winner in the first minute of stoppage time, and Tallyn Bronson provided the exclamation point with another stoppage time goal. The first half was a finely-balanced affair, and the only goal of the opening frame came when rangy Real Colorado midfielder Ian Kugler slipped a ball into the penalty area from the left side in the 16th minute. A dangerous striker always looking for gaps to exploit, Will Seiple did what he does best with the service, spinning in tight space and sliding home to the near-post with his deadly right foot. Pateadores, stung into a response, went on the attack for the next 20 minutes. Their best chance to equalize before the half came when a long, looping cross from the right was misplayed by Real goalkeeper Nolan Brynes and headed off the woodwork by Pablo Figueroa. Figueroa continued to be the danger-man for Pateadores early in the second half, and he was nearly through in the 51st minute only to be denied by Brynes, who dove to his right to pull off a fine save. The game began to open up as Pateadores continued to hunt an equalizer. They were rewarded for their endeavor in the 66th minute, when Nathan Franco curled in a stunning right-footed effort from way downtown to draw Pateadores level at 1-1. As both teams searched for a winner down the stretch, Real Colorado seized control in stoppage time. In the first minute, midfielder Sean Keeney collected a misplayed pass, dribbled past a slew of Pats defenders to the end line and sharply cut it back to Bushara near the penalty spot, where he drilled it to the back of the net for the game-winner. Just three minutes later, Bronson chipped home an insurance goal for Colorado, finishing off a deflected rolling attempt from midfielder Layton Purchase.